All right! Pity Party is OVER. I'm back, I'm finally feeling human, I can drink coffee again (!!!) and my family is all on the mend. So thanks for indulging me in my sob story yesterday, but like the Grinch, my heart grew three sizes times two overnight and I'm ready to get my Christmas on. So today's Friday Five is dedicated to finding my Christmas spirit again! Here are five ways I'm doing that! Christmas Music - This one is like, duh. Buddy the Elf says in the movie Elf, "the biggest way to spread Christmas cheer is singing loud for all to hear." Thankfully we have a station here in my city that plays Christmas music 24/7 from about Thanksgiving until Christmas and many years I don't give in until the week before Christmas, but I've pretty much had it on my car non stop this year and this morning I cranked it up loud and sang at the top of my lungs, including silly songs I don't even like that much like "Do They Know It's Christmas?" Oliver thought I was nuts on the way to my parents this morning but I don't care. I was rocking it out! She sent a copy of Gone Girl and I cannot wait to read it so then I can watch the movie. She sent me some Cheerwine which is a soda that I guess is manufactured in her home state of North Carolina and will not be made for much longer, so this will be a treat. She sent me a book for Oliver which I thought was so sweet. And she sent me this beautiful owl scarf and 2015 planner - which is the perfect size, I had been looking for one like this, it can go in my purse or my desk at work! To my sweet Santa if you're reading, I still owe you an email and I look forward to getting to know you better. Thank you! 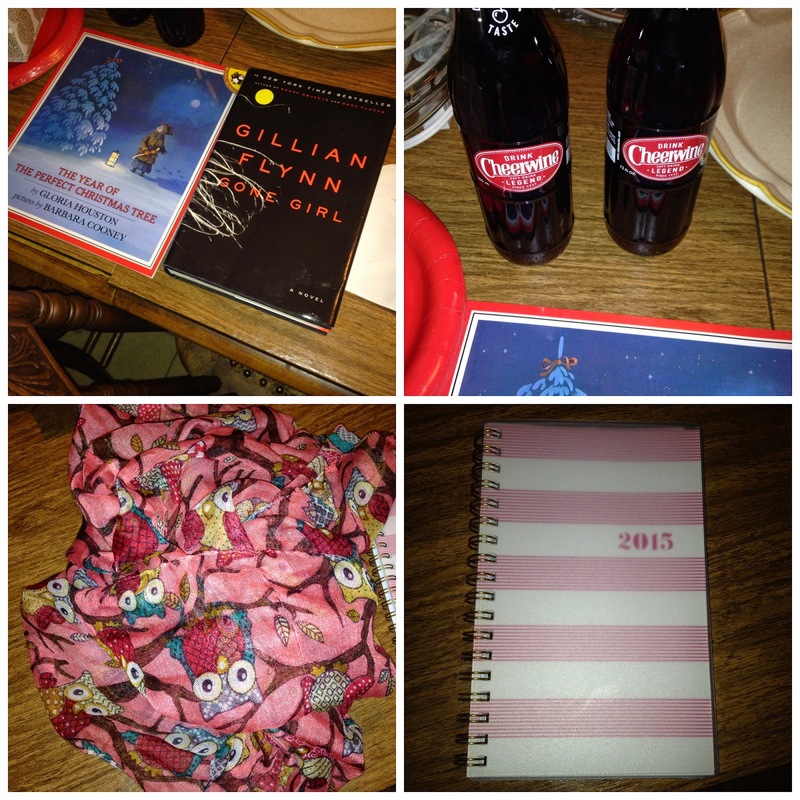 I had a second Secret Santa swap through a blog group I'm part of on Facebook. I was matched up with the delightful Britt from Taking Control. We found out we both have a lot of similar interests and ended up getting each other very similar gifts! 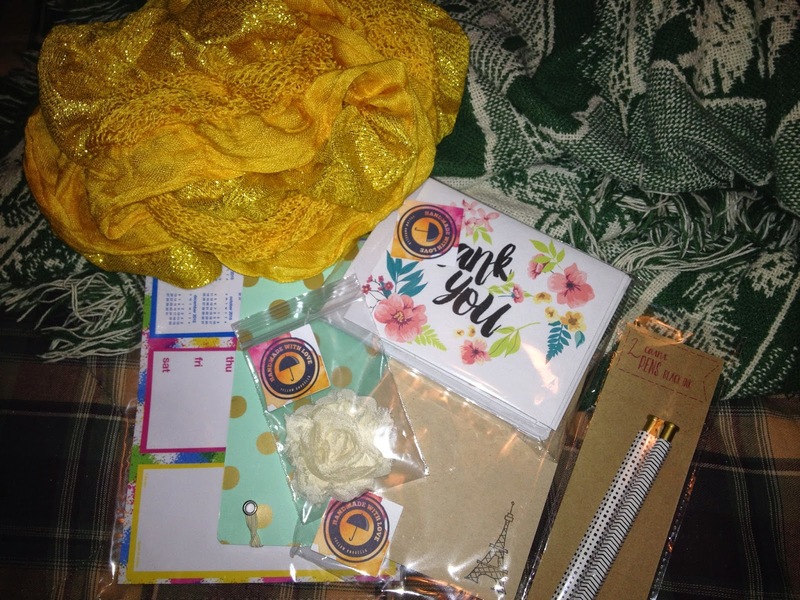 She sent me this gorgeous gold scarf that I wore on the blog yesterday, some beautiful stationary, thank you notes and pens, a beautiful flower hair piece, a notebook and pens and not pictured are some awesome cookies she sent as well! 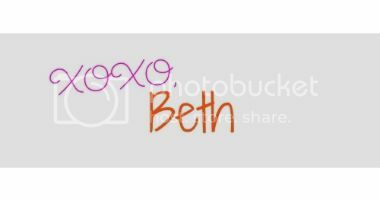 Thank you so much Britt! These are all awesome goodies! Santa - How can you not get in the Christmas spirit when talking about Santa? 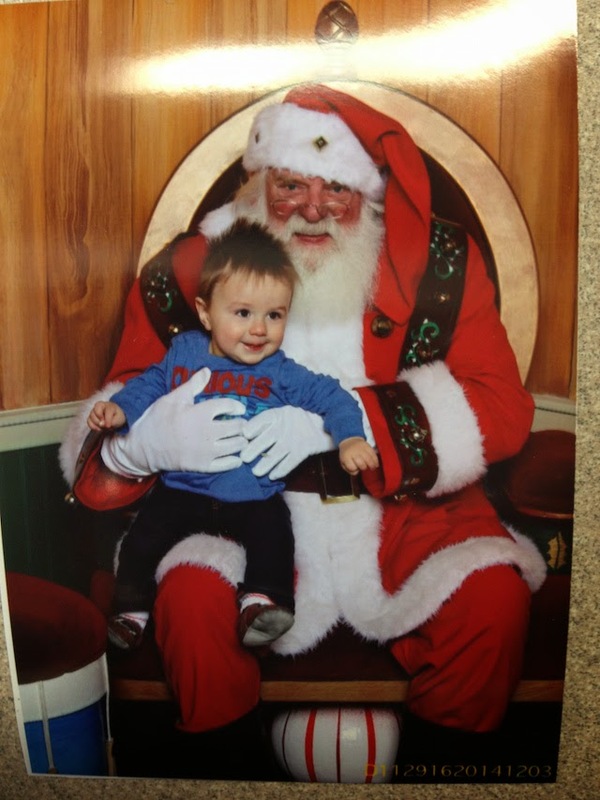 I realized I never shared Oliver's Santa picture here! It's a picture of the picture so sorry for the reflection. Nate hasn't scanned it into our computer yet, but I think it's pretty dang cute, he did so well that day! Holiday Gatherings - We are going to have a chance to go to a family holiday gathering this weekend and also a gathering with some friends we haven't had the chance to spend much time with in quite some time and I'm looking forward to both. Nothing gets you more in the holiday spirit than celebrating with people you love! And one upside to having just gotten over this nasty bug - I lost some weight (first world problems right?) so this chick is going to do some holiday eating without guilt! Christmas Movies - And finally, nothing gets me more in a holiday mood than a good Christmas movie. We watched my favorite - Home Alone - already last weekend, but there are so many others that I think we'll have to pick another one tonight! I also look forward to introducing Oliver to one of my all time favorites - A Charlie Brown Christmas. I will have to do that in the next day or so. So there you go! Sure, I'm still behind on a few Christmas things, but hey, there are 24 useful hours in every day and I will get it all done in time! Hope you all are finding Christmas cheer in the hustle and bustle of this very busy season too!